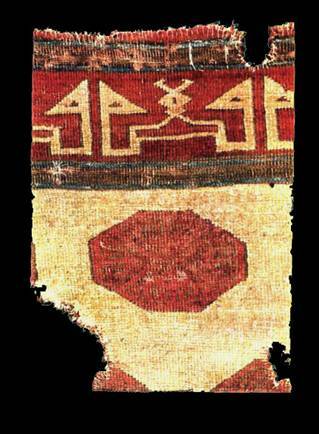 by Jim Allen This paper describes a possible mechanism for early Turcoman design evolution and more specifically how a 13th century Turcoman border design evolved into the field design or gull of a later 14th century Turcoman Rug. 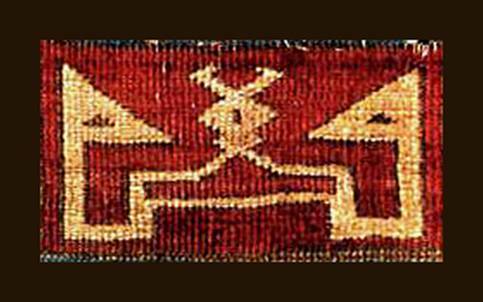 The borders of all classic Turcoman weavings have been under analyzed versus field decorations, especially tribal gulls. The fragment pictured below, slide #1, is from a 13th century Turcoman fragment at the TIME, Istanbul. The TIME also has a complete similar carpet on exhibition and it is extremely large, at least four times the surface area of traditional Turcoman main carpets. In many classical Turcoman weavings important symbolic complexes, mainly gulls and border designs, were paired with one white/positive and the other red/positive. In some classical Turcoman weavings the red is replaced with a deep royal purple. Regarding any pair of associated red and white symbolic Turcoman designs, one finds they are often 'meaningful' regardless of the viewer's perspective. I believe the Turcoman associated white with purity, spirituality, and the past/future while associating red with blood, flesh, and the immediate present. In slides # 2 & #3 I've cropped the main repeat design from the border of slide #1 thereby isolating its main components in direct vertical opposition or 180 degrees of difference. One sees that looking from the field outward the design complex is white positive. Moving off the rug and looking back toward the field one sees that the border design is red positive. By presenting this 13th century design complex two ways it is possible to see its white/red design complexes from two directions; without moving anything but the eyes. 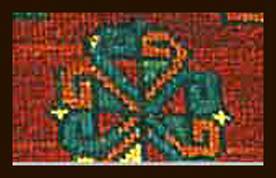 In the top border representation the major white positive image seems to represent two souls or "clan members" sitting at a table. Most traditionalists have interpreted these white dominant designs as representative of early Kufic script, but without much substantiation, reminding me that correlation does not mean causation. Looking from the white positive perspective the design's central or objective focus might well represent a skull with horns or a heart with wings though it is literally a diamond form surmounted by two half 'S' forms. Interestingly benches with rows of horns terminating in either a goddess figure or a skull with large horns has archeological roots going back to pre-Mithric times in Anatolia. If one 'sees' the central object of the white positive design as a heart with wings then it becomes very easy to see this heart being held up by the feet of the two white triangular headed souls or cult members. Looking at this design complex from a 180 degree shift in perspective, notice how this design complex immediately shifts focus from a white positive image to a red positive one. I define a dominant or positive signifier as that image, relative to any design complex, which entertains an intuitive or objective interpretation supported by secondary object relationships. From the red dominant perspective I see a person wearing a red robe with upraised arms. A red triangular head or maybe a hat with flaps floats above the red body with upraised arms. The 'eyes' of the upside down white triangular heads combine with the central focus of the white positive assemblage, that central perpendicular dark line, to reveal a spiritual presence or abstract anthropomorphic face or spirit. Viewed red positive what previously seemed to be a white skull surmounted by a rack of horns or a flying heart instantly morphs into a spectacular white necklace worn by the red or real time priest or shaman. Even today some animist shamen wear necklaces sporting large animal tusks or claws. The association of the red dominant signifier with a living priest or shaman causes, by logical inversion, the casting of the opposing white dominant cult members, sitting at the 'table', as either ancestors or spirits. This makes sense to me for in the classical Turcoman world spirits were as real as any shaman was. In fact, relative to the true Turkmen's animist ideology, a red priest or shaman juxtaposed with white spirits would be reinforcing in a process constantly iterated from the past into the present. I am reminded of how the Dali Lama is selected and the system of naming ancestors found in the Torah or Old Testament. Genealogy was extremely important to any Turcoman during the classical period; with individuals often swearing oaths or giving testimony by emphasizing their heritage as proof of their veracity. O'Donovan made extensive mention of the Tekke's genealogical proclivities in his book, The Merv Oasis. Traditionalists have usually termed the white positive objects in slide #1 as Kufic Keys or Kufic letters. The red positive aspect of this border design complex has been understudied or totally ignored. I wonder why the weavers of such a very large Khan's rug would have given "Kufic" letters or key's such prominent eyes? The spiritual presence generated by these minimalist white and red forms, reinforced or animated by secondary objects, is simply amazing. It is a Buddhist principle that only very simple forms or expressions can represent the most complex relationships and this philosophy seems to underlie the design aesthetic of this extremely old Turcoman border. Extending the principles outlined above; I am tentatively identifying a rug in the collection of the Vakiflar Museum, Turkey, currently dated to the 15th century, as possibly a 14th century Turcoman main carpet. 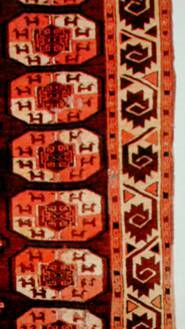 The rug is pictured below, slide #4, and exhibits a red positive border design along with two well known Turcoman minor borders. It also has a traditional Turcoman red field with traditional highly meaningful Turcoman negative space relationships. The innermost border of the Vakiflar's rug shows a well articulated "S" border closely associated with the later so called "S" group Salor weavings and Holbein rugs. This possibly raises a question about the origins of Holbein rug designs. I wonder if the later classic period Salor Turkmen were simply the same people as those earlier 13th century Ersari (Beysehiri's) who remained nomadic, leaving their 'brothers' to either become assimilated into the Turkish race or remain isolated in certain areas of Anatolia like Yahyali, Soma, Konya, or Lake Beyeshiri. In the 14th century rug's main gulls, slide #4, I perceive a relationship between its gulls and the red positive design of the earlier Turcoman Khan rug's border complex, slide #3. The 14th century Vakiflar rug' s main gulls are complemented by minor gulls and the negative space emphasizing these minor gulls is recapitulated in the center of each major gull. The implied outline of the hidden or secondary gull is almost exactly reproduced in each main gull center. The central motif of each main gull is a six pointed star while the hidden gull centers are derived from the earlier 13th century Khan rug's octagonal gull centers. 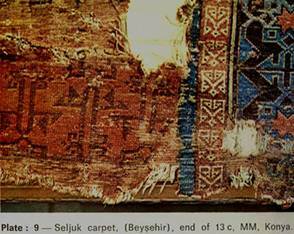 In Yetkin's book, Historical Turkish Carpets, she illustrates a number of Seljuk fragments with variations of the 13th century Khan's carpet border. In these peripheral or non Turcoman representations, the figure ground balance, seen in the original Turcoman border, becomes increasingly indistinct as the form de-evolves into designs with true Kufic resonance. 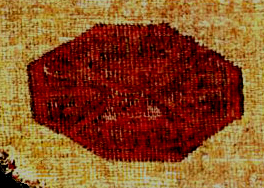 The red positive border element that I've described from the 13th century Khan's carpet can be mentally reflected by traditional Turcoman weavers and these reflections can be added together, in two axes at ninety degrees to each other, to form the "gulls" of the Vakiflares' 14th century Turcoman rug. I hypothesize that this is the manner of production for this gull. Remember the Turcoman carried the 'maps' for their gulls, emblems, or tribal designs in their minds. This implies that any Turcoman weaver memorizing, both forwards and backwards, one quarter of any "symmetrical" design could simply reflect the quarter twice, in two planes, to reproduce any given whole. Classical Turcoman gulls were not symmetrical and their distortions are meaningful thus the classical 'map' was colored with individual intentions and virtues. This was the basic point of my article in Hali #55. The secondary or minor gull decorating the 14th century Turcoman rug is literally a "spinning wheel" of conjoined "S" forms and has a direct evolutionary link to the small octagonal gulls of the 13th century Khan's carpet. These small octagonal gulls contain a simple design complex representing the intersection of four arrow heads. Interestingly the trailing edges of these arrow heads curl slightly inward. 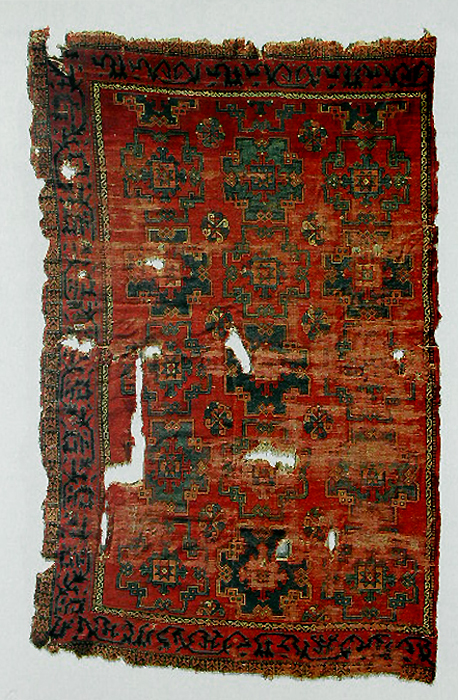 In the nomadic Turcoman rug from the 14th century the Turkmen were weaving carpets with a larger number of wefts and consequently their designs were elongated vertically. In the pictures below I juxtapose the 14th century Turcoman minor gull center with the octagonal gull from the 13th century Turcoman Khan's carpet. Accounting for the increased number of wefts in the later rug, they are very nearly identical. The later minor gull has no confining outline thus its octagonal shape is indistinct. Looking at these two design complexes side by side one can easily see the effects changing weave characteristics has on any design complex. I have assumed that since the octagonal gulls in the 13th century Turcoman Khan's carpet have the exact same aspect ratio of much later Salor octagonal minor gulls that they have similar weave characteristics. I have therefore assumed that the 14th century Turcoman rug has far more wefts than the 13th century Khan's rug has. The main border of the Vakiflar's 14th century Turcoman rug, slide #4, has a red positive design and its main design focus was the great trumpeting war elephants of the Khan. In the one remaining vertical main border segment (slide #7) of this early rug, one sees elephant's front halves viewed from the side and showing an eye, a tusk, a trunk, and an internally curling line. The internal "trunk" emphasized by a dark jagged outline represents the elephants' trumpeting sounds. What more auspicious symbol could a Turcoman weaver imagine than the trumpeting war elephants of the Great Khan? 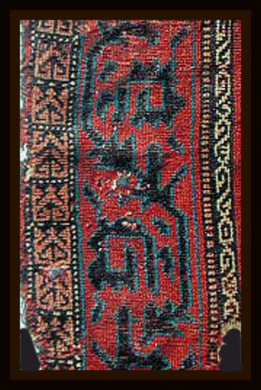 Both minor borders of this carpet are strongly related to classical Turcoman designs. The outer minor border is apparently associated with 13th century rugs from Beysehir in Eastern Anatolia, slide #8, and possibly to the main border of Peter Hoffmeister's very early Tekke torba, the first Turcoman Peter ever bought according to the text in Turkoman Carpets, plate # 25. Elephants were used throughout Central Asia during the Middle/Dark Ages and on into the 19th century. "One of the earliest depictions of an elephant in Middle Eastern history appears on Shalmanezer's black obelisk (dated around 860 BC) and accounts of the capture, diseases, and habitats of Indian elephants are found in the Arthasvanstra, the Mantannga-L'nlan, the Aristotelian corpus, and later Graeco-Roman treatments of these topics." The elephant head design is clearly meant to be experienced by its' native audience in association with a loud clarion sound. I call such designs phono-pictographic. This design evolved into the highly stylized border we all know from Tekke bird asmalyks and very early Chodor main carpets. Traditionalists call these borders "curled leaf", again without much if any substantiation. Notice in the border of slide #4 (see slide #7), how paired elephants are turned right and left with non-symmetrical representations inside of clearly defined cartouches. These cartouches are outlined by a dark blue 'flowering' line. This dark line (vine) along with its flowers punctuates the red border's field into meaningful shapes that represent the physical aspects of the elephant. The upper elephant turned to the left has a dark blue curved line representing its tusk and its trunk is realistically portrayed. The lower elephant, turned to the right, has two tusks represented in red plus a reinforcing blue curving 'tusk' line. The trunk is well represented in red and is reflected internally as a mirror image into the elephant's body, where it is given emphasis by a dark jagged outline. 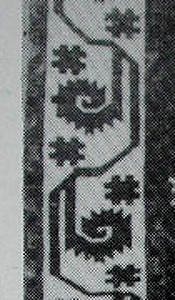 The trumpeting elephant design seen in the 14th century Turcoman rug became simplified and possibly more efficient when encountered, many centuries later, in Tekke Bird Asmalyks and proto-Chodor purple ground Main Carpets, demonstrating the forward evolution of this phono-pictographic design complex. In the early Tekke Bird Asmalyk border seen below, slide #9, the front half of the elephant seen in the 14th century Turcoman carpet main border has become more focused, evolving into a reciprocal and multi-dimensional representation of a trumpeting elephant's head. I have cropped the picture to show two complete repeat units of this design complex. The image to the right above is a drawing taken from an ancient carving found on a column at Petra. Looking at the border with its vertical components upright it reads as a reciprocal design complex representing first one elephants head with a cross hatched symbol representing a combined eye and ear along with a curled up trunk. The trunk is emphasized by a jagged inwardly curving line representing the great bellowing sounds of the elephant. Within this design complex the reciprocal elephant's head shows its trunk hanging straight down/up, therefore this elephant is quiet, without any visual emphases suggesting sound. This design complex is multidimensional because when one's perspective shifts 90 degrees to look at the vertical border segment at 90 degrees to normal, the design complex morphs into a single representation of a bellowing elephant's head with two cross-hatched eyes and a curled up trunk. 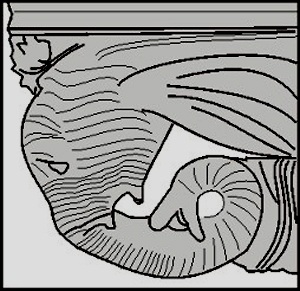 In this orientation the curling trunk seems closer in space to the observer than the elephant's cross hatched eyes because of the way we process spiraling or curling lines. These elephants must have seemed right there bellowing at the native Turkmen who got to see such things close up. The phono-pictographic elephant's head border becomes more simplified in the later 18th and early 19th century examples. These later renditions of the reciprocal elephant's head complex lose two angled lines per complex. These lost lines of information helped to emphasize the elephant's forehead and trunk. Those extra lines helped an observer to resolve the 'head-on' perspective into a more convincing image of an elephant's head. Their loss represents design de-evolution and I believe indicates a period emphasized by a breakup of traditional values and designs. I believe this was consistent with historical Turkmen experience of the later 18th century and early 19th century, a period of turmoil. I am showing two examples of these later and more simplified border designs below. While the design complex retains it's classical meaning in the late 18th and early 19th century it soon thereafter began devolving into a design complex that was even less meaningful. The degree of meaningfulness, regarding any Turcoman design complex, is of the utmost importance to me and indicates the position of a design complex along the time line of Turcoman history. The border to the left, slide #11, is from the purple group proto-Chodor main carpet, with velvet like wool and intense coloring, at the V&A museum in London. The other, slide #12, is from the large Bird asmalyk collected by Arthur D. Jenkins, presently situated at the DeYoung Museum in San Francisco. I hypothesize that over the centuries the evolution of the bellowing elephant motif mirrored a maturing of the Turkmen's understanding of what mechanism elephant's used to produce their trumpeting sounds. It seems fairly obvious to me that the 14th century Turcoman designer/shaman/weaver felt that these trumpeting sounds were emitted generally from the front half of an elephant's body as reflected in border representation from the 14th century Turcoman rug discussed above. Later in time this stylistic idea evolved into an understanding that trumpeting elephant sounds actually emanated from an elephants head/throat area and not from its whole front end. Through the centuries this phono-pictographic design complex increasingly focused on the elephant's head with one trunk curled up and the other hanging straight down. Elephants curl their trunks when bellowing to keep the air expelled from their lungs going out through their throats and not out their trunks. In conclusion the narrative quality of classical Turcoman weaving does seem greater than the narrative qualities of later Turcoman weavings. I have described how the red positive image of a gesticulating 13th century Turcoman shaman, wearing an animal tooth or tusk necklace, evolved into a set of four such shamen standing along the four prime meridians transecting the octagonal star centered iconogram of a long dead Turcoman people or tribe of the 14th century. Turcoman designs evolved to suit the metaphorical needs of the Turcoman people during the classical period. I believe these needs were judged by Turcoman shamen and their Khans. During the 19th century the Turkmen were frequently under attack and were driven from the Akhal oasis in the 1830's. The Russians kept on attacking ultimately culminating in the Tekke's total defeat at the Merv Oasis in 1882. During the 19th century Turcoman weaving became much more of a commercial enterprise because of the Tekke's need to acquire capital to buy arms and materials. The commercialization of their weaving caused the slow loss of design integrity and meaningfulness throughout the 19th century. This was not a smooth decline and several periods of intense commercial weaving created a body of work punctuated throughout with rather cold flat two dimensional weavings mixed in with true dowry weavings of extraordinary quality and beauty. My method of study has always been inductive so I am constantly looking for rugs that seem 'archetypal'. 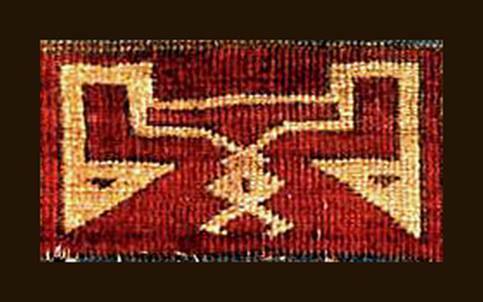 I have experienced or owned a fair number of such foundational archetypal weavings and these experiences have helped educate me. I feel that the Turcoman rug described above now housed in the Vakiflar Museum in Istanbul is such an archetypal rug and one that has been very much under appreciated.